Jazz Act in Country NSW. 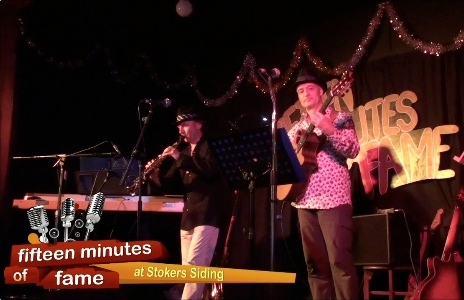 Fifteen Minutes of Fame at Stokers Siding NSW – held the first Friday of each month. The featured act shown here is Jazz Musicians Marcus Nassner and Rudi Gerhardt. Fifteen Minutes of Fame format is 3-4 blackboard acts, intermission and then the featured acts – it is a lot of fun, and there are first class musicians from all over the world who surprisingly show up and sing! A great night out, and the local Hall Committee serve a great dinner & dessert.